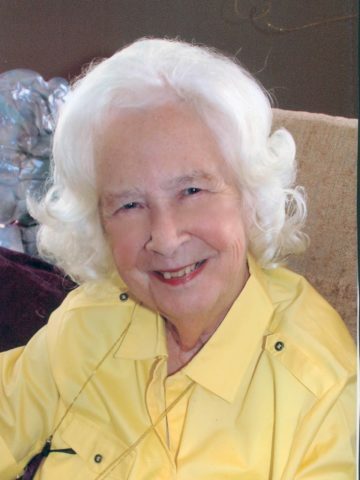 Following several years of declining health, Patricia Elaine McCord Meadows, age 88 years, died peacefully Wednesday night at The Meadows / Lakeshore Health Center with her daughter and son-in-law by her side. Mrs. Meadows was born June 2, 1928, in Fort Wayne, Indiana. Her parents were Arlyn H. McCord and Addie Smith McCord (now deceased) and she had two sisters, Aileen McCord Layne (now deceased) and Juanita McCord Allinder, who survives. Mrs. Meadows was married to Edward M. Meadows for 65 years and to their union there was born one daughter, Pamela Aileen Meadows Altom (Ken). She attended Hume Fogg High School, and was employed for many years by The Kroger Company. She served in the Eastern Star (Rock City Chapter), and with her husband, E.M, she worked in Bellview Masonic Lodge # 716, and Al Menah Shrine Center all for the betterment of her community. Family and friends are invited to make memorial donations to the ministry of West Meade Fellowship, 277 Old Hickory Blvd, Nashville, Tennessee 37721 honoring God and with thanksgiving for Patricia Meadows. A Celebration of Life service will be on Saturday, March 25, 2017, at 2:00pm, at West Harpeth Funeral Home with Reverend Bob Pearce officiating. Visitation will be one hour prior to the service. The Interment will take place on Tuesday, March 28th at 10:00am, at Middle TN Veterans Cemetery. Condolences on the physical loss of this beautiful lady. May your memories and the fact she no longer will suffer from any illness bring you comfort. So very sorry for your loss. Please know you are in my prayers. Sincere prayers for an outpouring of God’s sustaining grace for all of the family during this time. Pat was a wonderful neighbor and we are really going to miss her.